7 pages of text, 68 pages of full colour details plus three separate sheets with plan, port and starboard views of the ship in full colour, line drawings of various aspects of the ship and 1/350 scale plans. Full colour details of every aspect of the ship from every angle. These 3D books have unbelievable detail and are therefore invaluable to the serious model ship builder. Gneisenau and her sister Scharnhorst were the first real capital ships built for the German Navy since the end of the First World War. The previous Deutschland class was really over-gunned heavy cruisers with insufficient speed to keep out of trouble. Often termed as Battlecruisers, the Scharnhorst class were really fast Battleships and although they retained the 11 inch main armament of the Deutschlands, provision was made to re-arm them with 15 inch guns later. These 3D books from Kagero and unbelievable in their detail, showing the ships from every angle, in colour, over-all and in close-up. In this case, there’s also a full colour profile (plan, port and starboard views) in, I think 1/700th scale (not stated), 1/350th scale plans and line drawings of many aspects of the ships structure on three separate sheets. However, don’t take the drawings too literally. Considering the ship has not existed for over 65 years, there are bound to be areas where the authors have had to make educated guesses. Here is a case in point. In one of the 3D books I reviewed, awning stanchions were show in place and on close inspection appeared to be permanent but this could not be as they would interfere with the fighting of the ship and therefore must have been removable. This is not meant to be a criticism of the books as I think its remarkable how much they have got and the clarity with which they’ve been able to reproduce this detail. 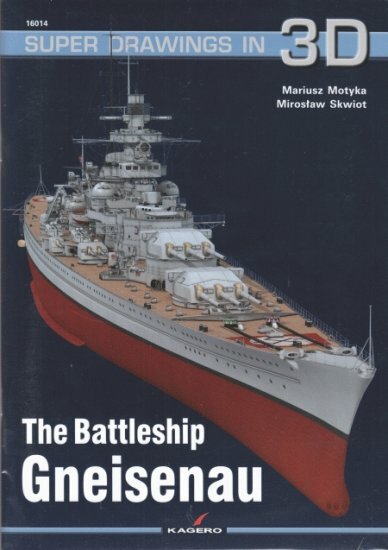 If you want to build one of the excellent Gneisenau kits around this book is about all you will need.